One month after a man was deported from neighbouring Suriname, he killed his ex wife after she rejected his overtures, a family member of the woman said. 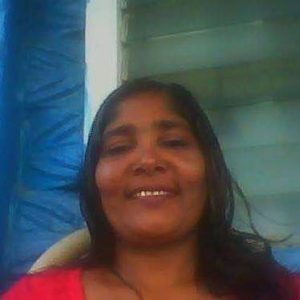 Forty-year old Minty Karamchand, a mother of five, was beaten and chopped to death by her ex- husband at their home located at Lot 19 Sheet Anchor Village, East Canje, Berbice, police confirmed. Eyewitnesses said after committing the act, Oswald December ran from the house with a rope and swam across the Canje River. Police and villagers traced him but found only fresh footprints on the other side of the river. Relatives said December and Karamchand had been together for about 20 years. They separated and he went to neighbouring Suriname until one month ago when he was deported. Sources said on his return, he went to Sheet Anchor and resided at the house owned by his family. However, the woman allegedly told him that she was no longer interested in a relationship with him. The Guyana Police Force later said in a statement that December is currently being vigorously pursued by a team comprising of police and civilians, in the Canje River. 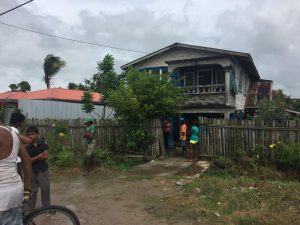 The house at Sheet Anchor, East Canje Berbice where Minty Karamchand lived until she was beaten and chopped to death by her ex-husband. “Investigation revealed that about 09:30 AM an argument erupted between the couple who were in the lower flat of their house, over the victim being unfaithful. As a result the suspect became annoyed, picked up a small wooden stool and dealt the victim several lashes on her head, causing her to flee the house by jumping through a window. Not satisfied, the suspect armed himself with a chopper, went after the victim and inflicted several chops to her hands, feet and head causing her to collapse after which he allegedly collected a piece of rope and fled across nearby the Canje River,” police said. The victim was rushed to the New Amsterdam Public Hospital where she succumbed about 10:30 AM whilst receiving treatment.